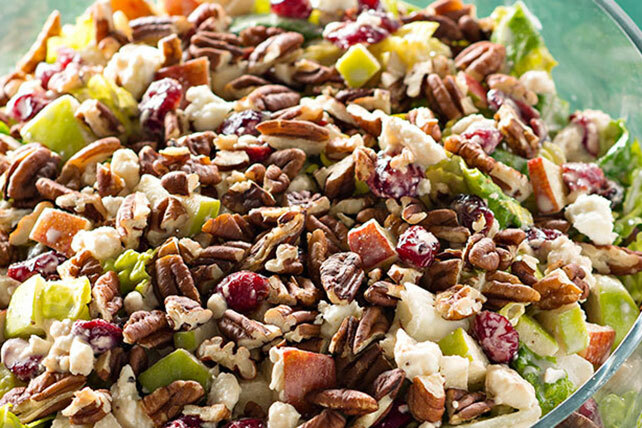 Whip up this festive salad with apples and cranberries for your next holiday party. Then sit back, relax and let the compliments come your way. Save 70 calories and 9g of fat, including 1g of saturated fat, by preparing with KRAFT Light Mayo Reduced Fat Mayonnaise and KRAFT Lite Balsamic Vinaigrette Dressing. This colorful layered salad can be refrigerated up to 24 hours. Do not top with nuts before refrigerating. Toss salad and top with nuts just before serving.